Bunch Studio and the white rabbit wishes everyone a very Happy Easter!!! This picture was taken by my friend J who emailed it to me last week. Her husband R and her had been thinking it would be fun to add a couple of pet rabbits to their family (they have 2 adorable kitties). 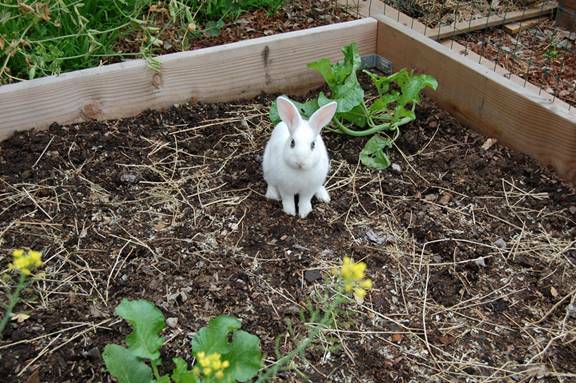 One night R let the cat out and then discovered this white rabbit in their garden pen. J came out to see it and then it ran away. The next morning they woke to find that it was still hanging around, so they are keeping it safe happy and fed until someone claims it. She says he’s quite cuddly. He arrived just in time to celebrate Easter! This entry was posted on Sunday, April 4th, 2010 at 9:43 am	and tagged with white rabbit and posted in Uncategorized. You can follow any responses to this entry through the RSS 2.0 feed.